When established, the Company's main field of activity used to be the servicing of the electrical engines of industrial equipment. Its technological and technical expertise has enabled the Company to implement further development projects, and by now manufacturing of medium-powered electric power engines constitute a significant part of the production. The Company had been established at the same time as the TVK Chemical Works, for servicing the electric machines and equipment of the Chemical Works. Later on the Company was privatized and after several changes in ownership, in 2002 it was acquired by BanKonzult Ltd.
By now BanKonzult Energy Co has advanced to a company manufacturing and servicing electric power engines using state-of-art technology and instrumentation. The Company's scope of activity comprises the manufacturing of medium-powered explosion-proof induction motors as well as windmill generators. The Company's servicing activity comprises diagnostic testing, repair and overhauling of all kind of electric power engines up to 10kV with no limit on performance. Beyond the conventional types of a.c. electric power engines the Company also performs the servicing of d.c. electric power engines. Apart from electric machines, servicing of switching and automatic devices is carried out, the same as repair and overhauling of generator driving turbines. Diagnostic tests include checking of the electrical mechanical condition, temperature, bearing condition etc, as well as testing of the polarization index, the dielectric discharge factor, leakage current, machine performance. The Company's instrumentation is suitable for measuring the block testing stand performance of electric machines, as well as for the analytic measurement of the loss factor, the slip-, noise- and vibration spectrum both on-site and in workshop. Among the laboratory tests alignment and balance tests are particularly noteworthy; for 4 t, 6 m, O 1,6m rotating weight up to 3000 rev. evaluation is made according to ISO 1940 (precision, as well). Workshops built last year to manufacture new motors deserve attention, one in Tiszaújváros and the other one in Nyíregyháza where windings for windmill generators and for explosion-proof motors are mass-produced up to 2000 kW, using special technology. 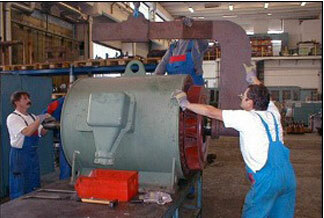 600 m2 workshop has been equipped for mass-production of windings for new induction generators. The Company has a staff of 100 people. Thanks to a steadily increasing portfolio of orders, members of the staff are given in continuous training. The appropriateness of the Company's quality assurance system is certified by ISO 9001:2001 and ISO 14001:2005 certificate, and an organisation has been established to operate this system. The new machines and engines are produced for export, while the service activity is oriented both to the home and foreign markets.